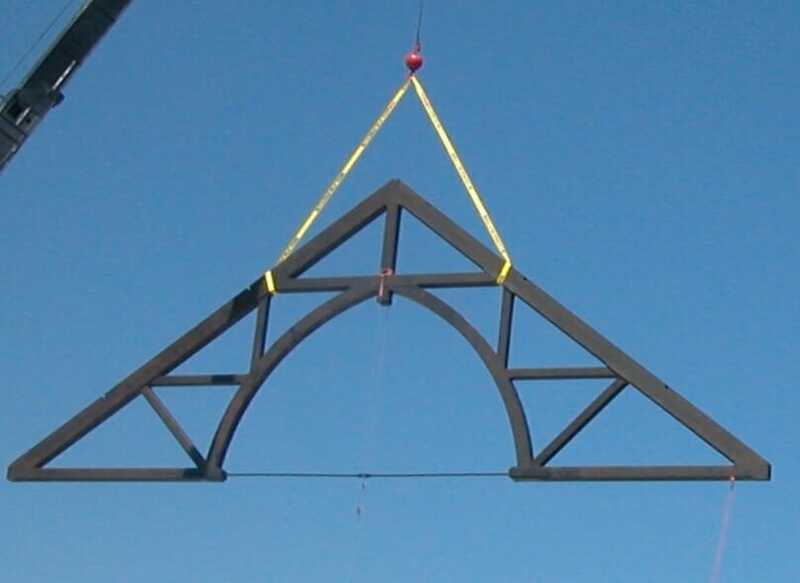 Our crew often travels to the job site to assemble and raise frames. The same craftspeople who cut the frame also put it up. 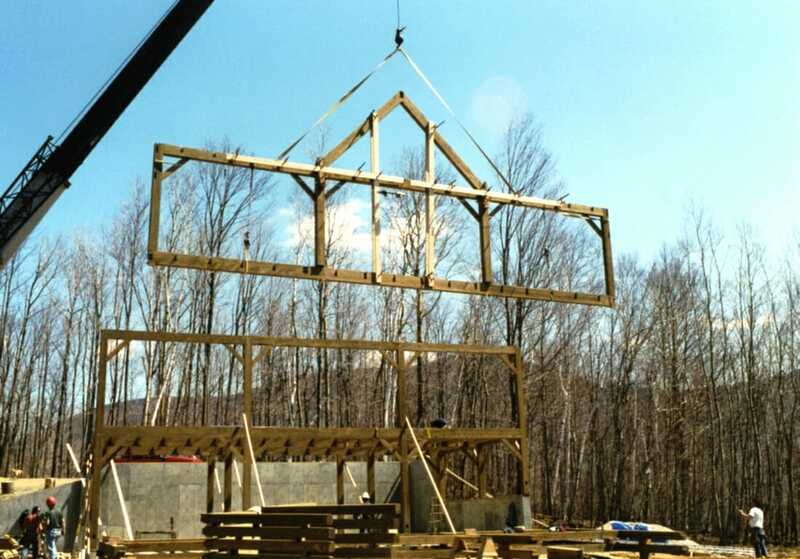 Most of our post and beam frames can be erected in a matter of days. We pre-assemble parts of the frame in our shop whenever possible. Then, once on site, we use large cranes to raise the frame. 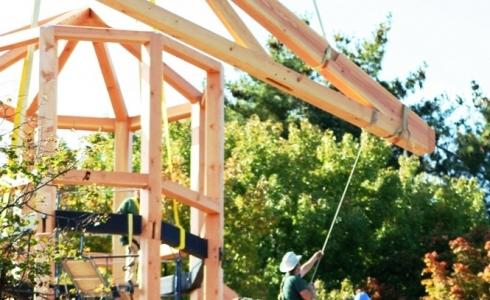 In less than a week, a timber frame can be complete and ready for a local contractor to finish. 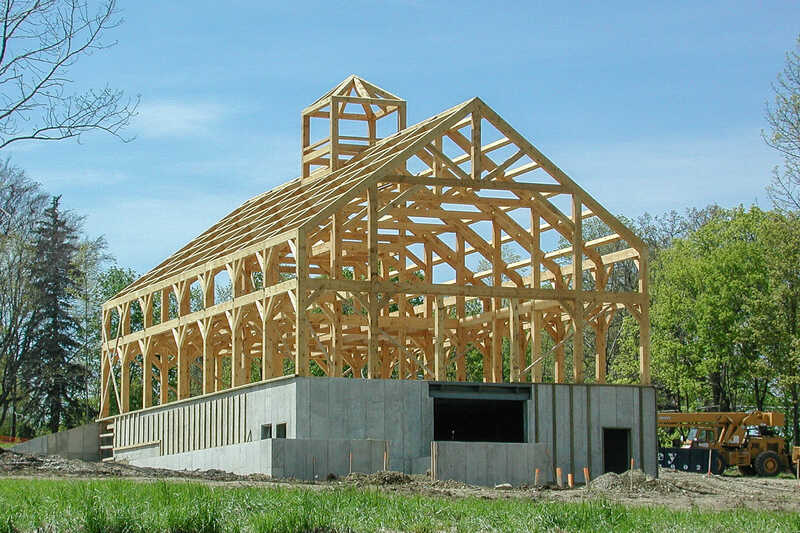 Scroll down the page to see the process and techniques we use to assemble and raise custom timber frames and check out this time lapse video of a timber frame barn raising. 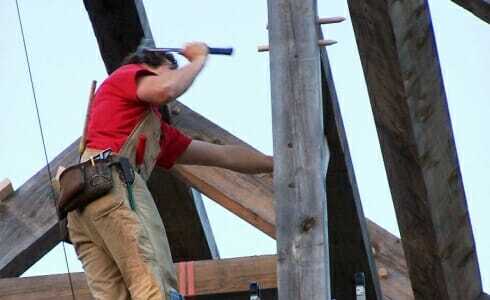 Check out the tools we use to raise a timber frame. The assembly & raising process begins after fabrication. 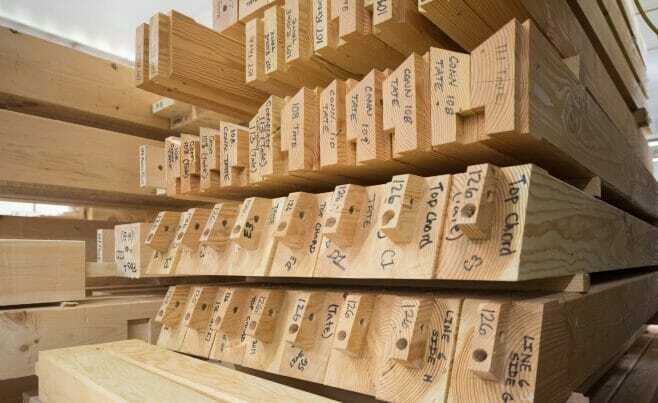 Every cut of timber is labeled for its place in the frame, and then it's organized into bent material, purlins & or rafters, and connectors. 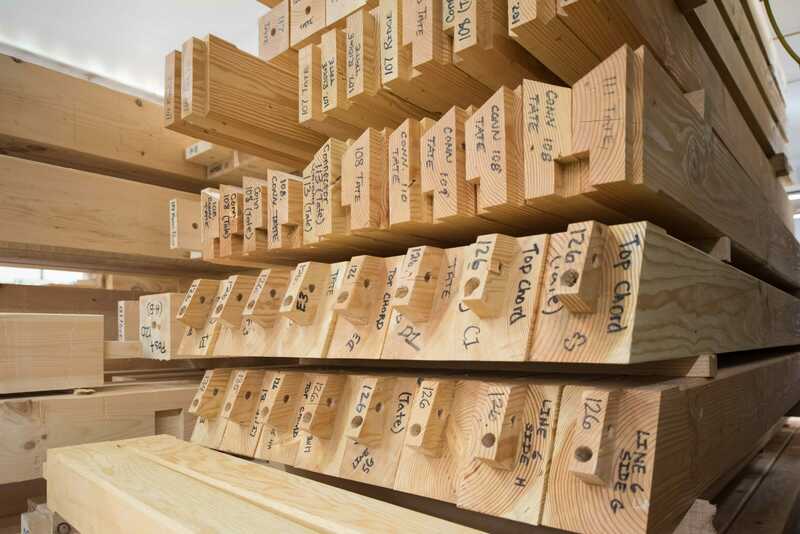 The organized timber is packaged for shipment. 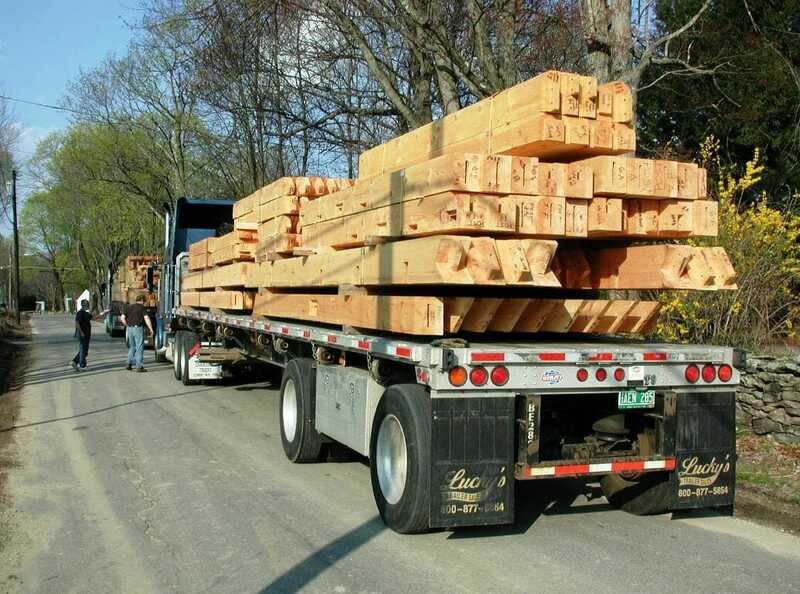 The parts for the timber frame are delivered "knocked down" to the job site on 48' tractor trailers. 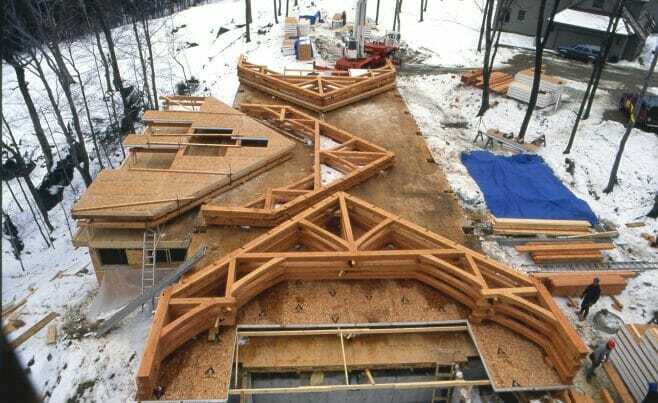 Bents and trusses are assembled on the ground. 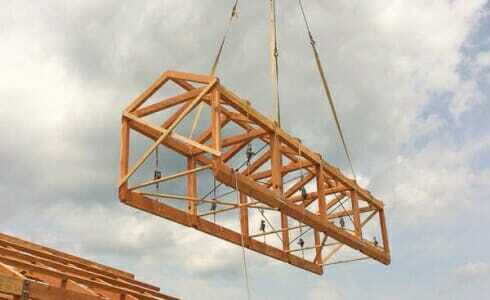 In this picture, a girder truss is being assembled. 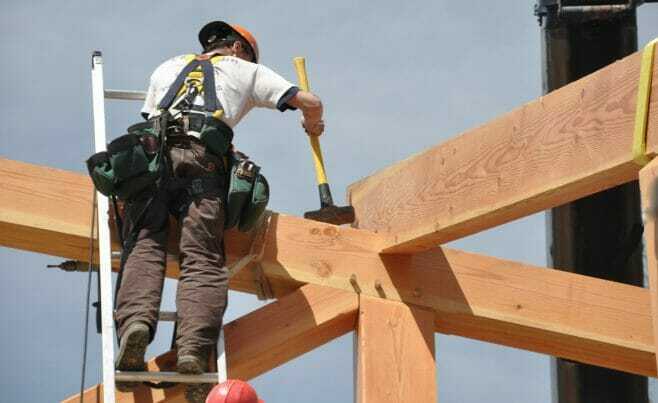 Come-alongs (the things with the handles) help pull the timber together and hold it tight while pegs and bolts are driven into place. 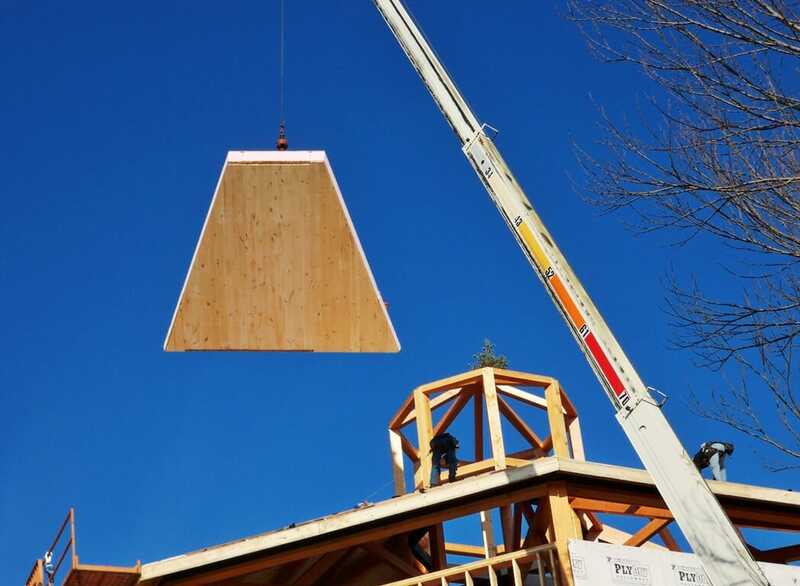 Once on site, the bent pieces are put close to the building to be pre-assembled, and the purlins, connectors and ridges are put where the crane can reach them on the day of the raising. The crane arrives on site to lift the pre-assembled bents. 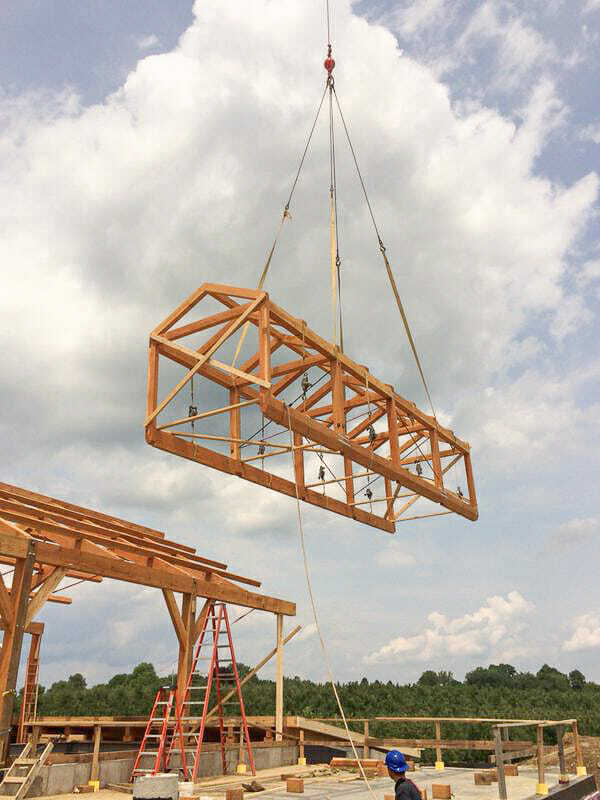 This photo shows a section of a building that was pre-assembled on the ground being lowered into place by a crane. 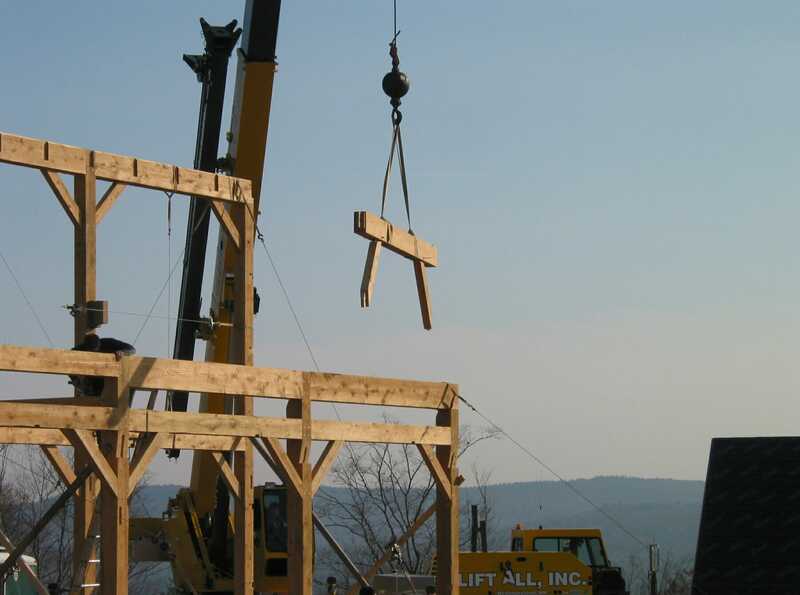 Bents are brought down and secured to the deck and temporarily braced with 2x4 cross bracing. 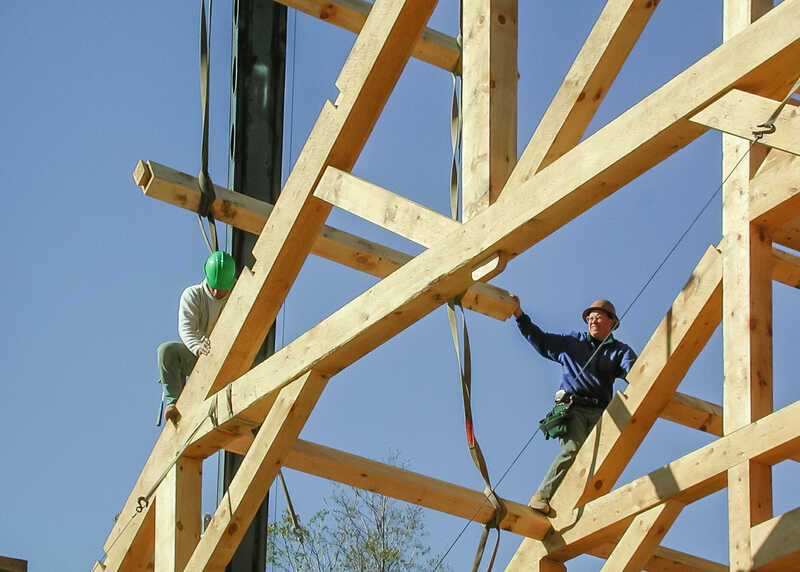 This photograph shows timber framers walking the bent to align the bottom of each post with its proper position. 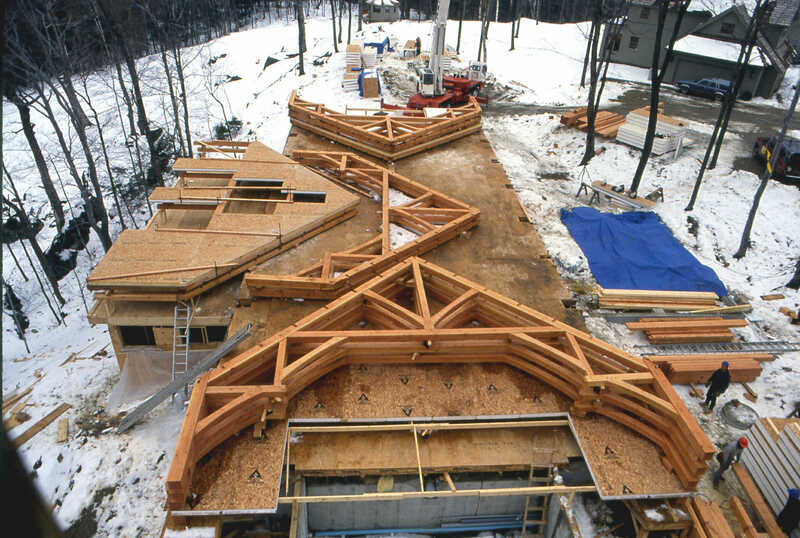 A timber rafter is being placed between bents. Notice the notches in the bottom of the rafter and in the top of the bent. 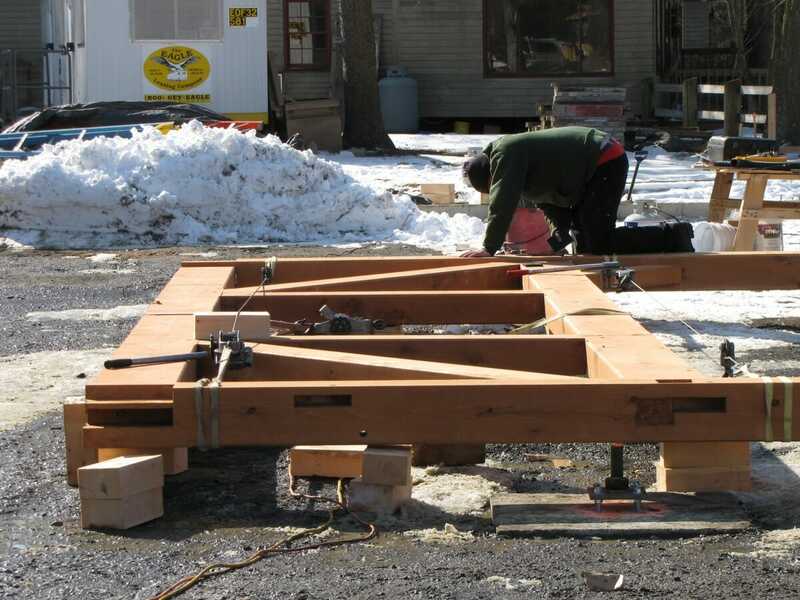 Once the bents are in position, the 2x4 bracing is released and the bents are spread open a few inches so the connectors can be put into place. 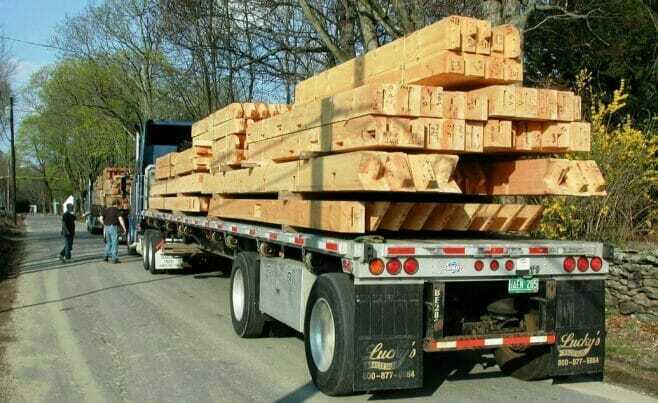 When the connectors are in place, the bents are pulled tight with come alongs and the connectors' tenons are pegged tight with hardwood pegs that are driven into place by hand. 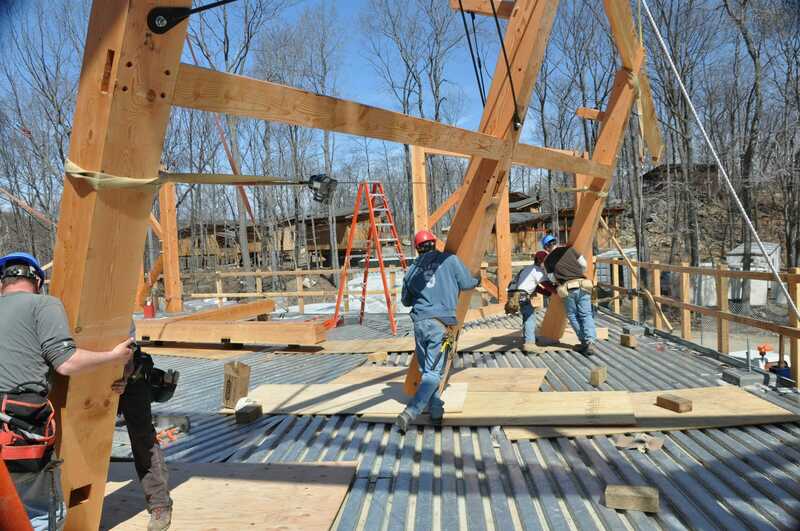 Next, purlins are lowered into their pockets. 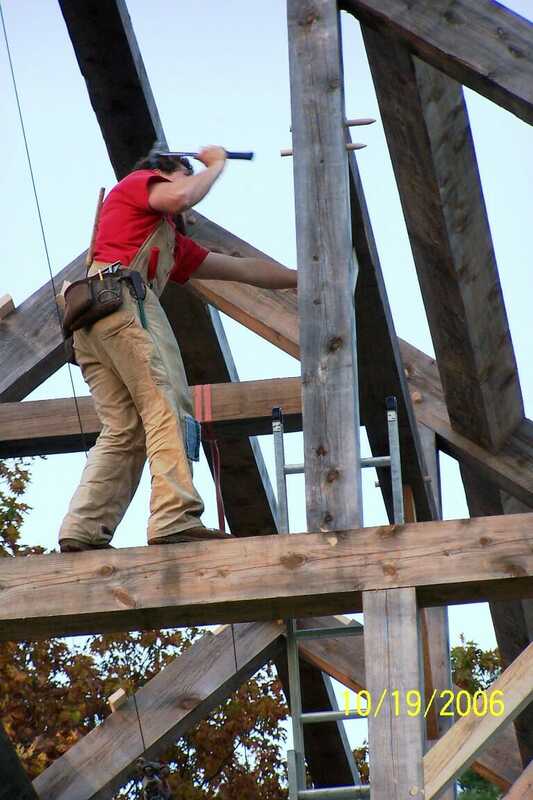 Then hardwood wedges are driven into the purlin pockets to secure the joint. Entire prea-ssembled sections are picked up and lowered into place. 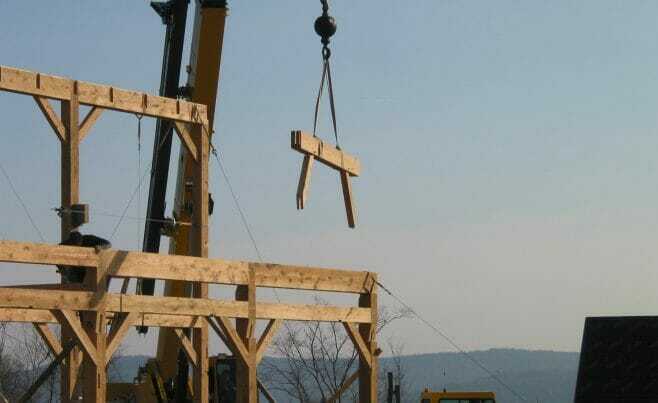 This assembly will top the ridge a barn frame. 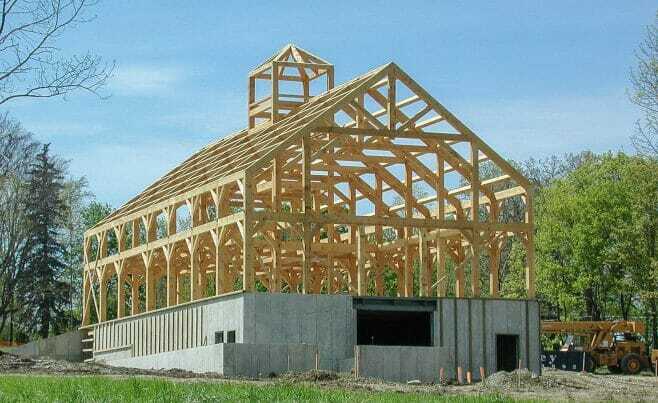 Finally, the timber frame is tightened and completed except for the tree on the high gable. 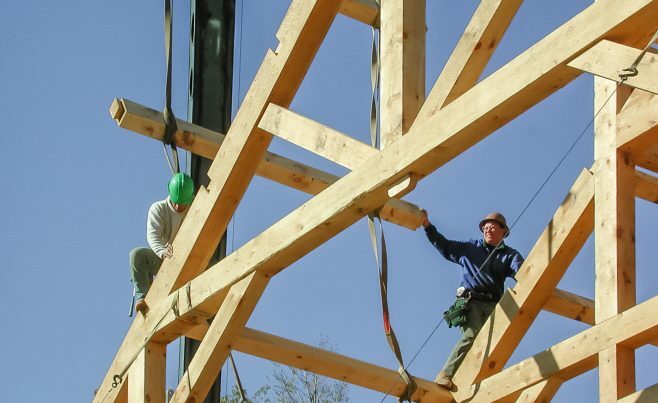 Nailing a tree to a timber frame is a good luck German tradition that builders carry out even to this day. 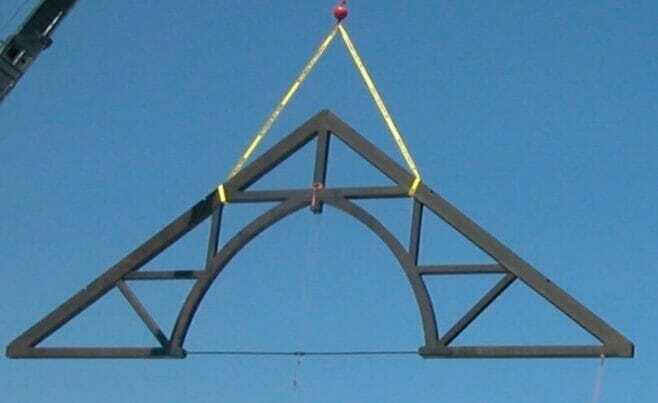 This beautiful church truss is 48' long by 21' high. It is douglas fir stained dark to look like old cathedral ceiling beams. 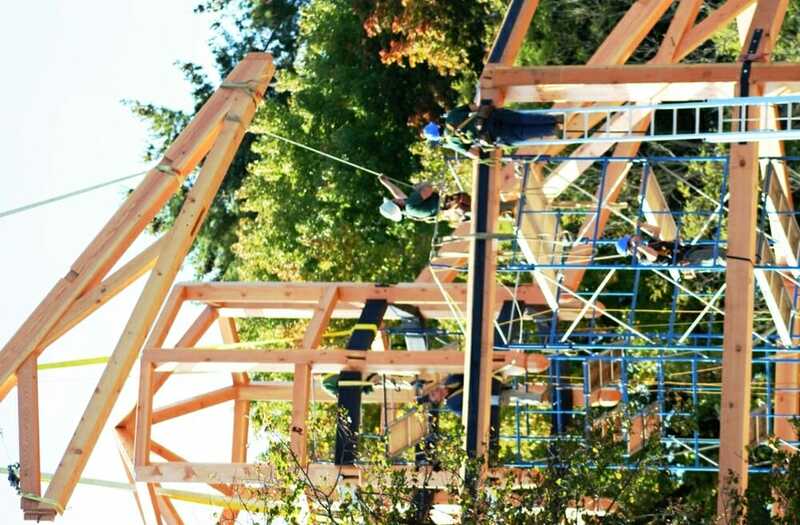 Tag lines (the ropes) are used to spin the trusses in flight and direct them into place. 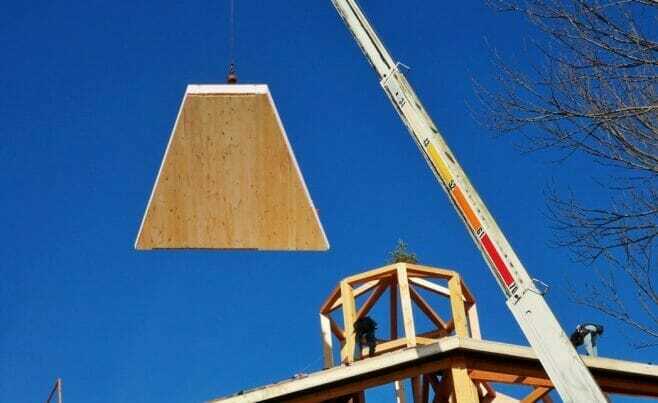 Super insulated foam panels are fabricated and cut to size at the stress skin manufacturer's shop, then shipped to the job site ready to be installed.